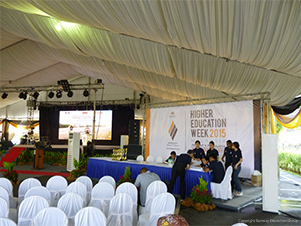 The stage was set and Sunway College was proudly represented along with hopeful participants from 7 other local universities. There were two categories in this competition: the Nusantara Category which involved students from neighbouring Brunei and Indonesia, and the International Category, in which students from outside the region as far as Kenya, Iran and Yemen took part. 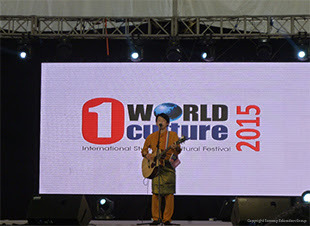 The competition was a platform in gathering and introducing international students to the Malaysian culture. Three Australian University Program (AUP) student participants from Sunway College - Muhamad Zuhaldi and Ricca Agness competed in the Nusantara Category while Masahiro Kato from Hiroshima, Japan competed in the International Category. Ricca Agness had to calm her nerves, being the first contestant of the day but when she took centre stage, it looked like she owned it. The crowd gave her an approving applause as she belted out the popular Siti Nurhaliza’s classic ‘Bukan Cinta Biasa’. Looking stunning in her outfit and flowered-head band, she kicked off the competition on a ‘high note’, appearing confident and poised. 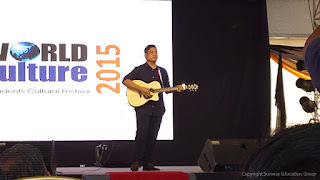 Muhamad Zuhaldi was the sixth contestant who came on stage with his guitar and another powerful instrument - his voice. He sang the ever classic hit ‘Kau Ilhamku’ in a slow-rock version that rang through the open surroundings with some people humming or swaying fondly to the familiar tune. There was a warm fuzzy feeling as he decreased his tempo and showed off his voice control with much prowess. Then came the International category with participants from various countries in colourful costumes. A challenging task for non-Malay speaking contestants, there were Malay hits sung with a creative twist and with impressively impeccable pronunciation. 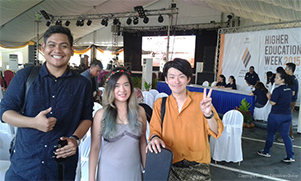 Masahiro came on stage as the sixth participant, clad in a brightly coloured Baju Melayu, complete with a small Malaysian flag sticking out of his vibrantly shimmering sarong. After greeting the audience in Malay, he proceeded to astound the crowd with the catchy melody of ‘Gemuruh’ by Faizal Tahir. The part that got the audience’s immediate excitement was when Masahiro deceived them as through he was ending the song, but played on and sang the words ‘Saya suka Malaysia!’ repeatedly. The crowd went wild with cheers! The judging panel comprised of respectable figures such as renowned composer Fauzi Mazuki and the Dean of Two Music Faculties from the local universities. Fauzi took the microphone to give general pointers to the participants, explaining the criteria for their decisions. These included vocal quality of pitching, tone and tempo, performance and creativity as well as costume. After all the anticipation, the emcees announced the winners in each category together with the special titles. Much to our delight, Muhamad Zuhaldi was awarded Special Judges Award for Best Vocal. 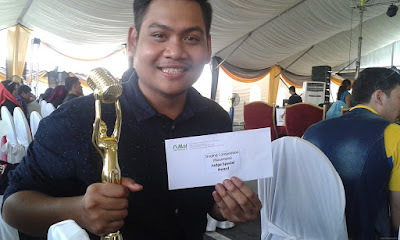 He received a shiny and rather handsome looking trophy with RM350 cash prize. Masahiro emerged as 2nd runner up for the International category and also won a separate title for Best Performer! 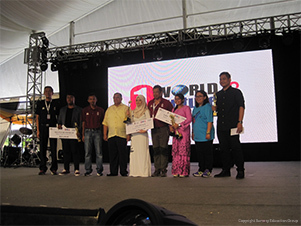 He took home two shiny gold awards and a cash prize of RM1000. Sunway College’s AUP students became celebrities for the day with many people congratulating them, offering words of encouragement and appreciation for their outstanding performance. The students handled the questions and conversations with much professionalism, containing their excitement even though they were practically mobbed by the paparazzi! 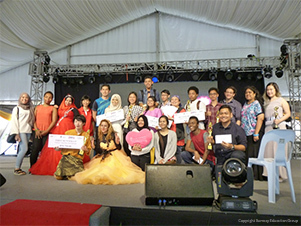 The two Sunway students with the two winning titles were specially requested by the organisers to perform at the closing ceremony the next day. This was originally not part of the plan as only the champions for both categories were to perform. 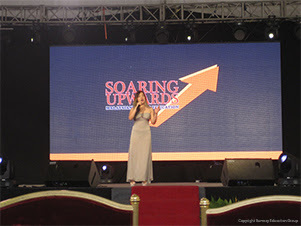 The organisers mentioned how they enjoyed their delivery for they were crowd pleasing performances. So, Masahiro and Zuhaldi attended the closing ceremony the next day and belted their hearts out with pride and honour! 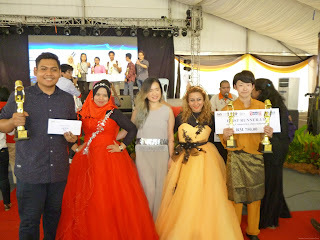 Sunway College participants with their trophies together with two other participants. It was undoubtedly a rewarding day for the student participants and the support team, Sunway College AUP contestants were able to demonstrate the holistic and empowering aspects of higher education. Through their first-time exposure, they gained confidence and learnt lessons of discipline, humility, teamwork and interpersonal communication. This was evident from the many alliances they made by mingling with the other participants. It goes to show that when potential meets talent and the opportunity is seized, the outcomes are indeed gratifying. The spark has been lit and this is only the beginning.